You smile but pretend to be sleeping. Suddenly, with a whoosh and a cry of “daddddy” your little guy jumps on top of you. You give a big growl and then flip him over in a tickle attack, ending with a kiss on his tummy and then his nose. “Good morning son,” you say. “Good morning daddy,” he replies. You slip a finger along his waist, his diaper crinkling reassuringly, and find your little guy, as expected, wet himself last night. But instead of making a beeline for the change table and a clean diaper, this might be the perfect time for a Saturday adventure. One of the joys of taking care of an adult baby or ‘little boy’ is seeing the sense of play, adventure and creativity that seems to be a natural extension of he is inside. An adult baby is able to express their inner spirit in so many ways – playing with toys, stuffed animals, blocks, and games. Simple, tactile things that hold the promise of imagination and just plain fun. Take a ‘son’ to the zoo and just the look in his eyes makes it worth the trip – curiosity, oohs and ahs, and then peppering daddy with questions: “do you think the animals are happy”, “do you think baby animals feel the same as human babies”, “why is an elephant grey instead of purple or yellow”. For a dad, this sense of curiosity is not unlike being a tourist in your own city. An AB gives his dad a gift, reminding him that we should look at the world with fresh eyes. So next time your little guy slips out of his racing car bed and rushes to your room on a weekend morning, take the chance to give him an adventure. If it’s one of those grey, lazy days that feels like a good time to spend at home giving him lots of love and attention, then there’s no better way to give him a sense of cozy, playful care than by never leaving bed at all! (Or for a few hours at least). Tell him you have a special surprise. That he and daddy have a journey to take – across the oceans and over the seas. And that the bed is your ship – it’s a special ship, of course, disguised as daddy’s bed, but he’s smart enough to know that it’s really a …. a what? A sailing ship? A yacht? A pirate ship? But before you cast off – time for some supplies. Grin as he scurries off to grab all the necessities: stuffed animals, Legos, swords, cars, and Fruit Loops. While he’s grabbing his favorite toys, make sure you grab a big stack of diapers and changing supplies, his paci, a bottle or two of milk or juice, crayons and coloring books, and his sailor’s outfit (I picked up the cute outfit above on eBay). Once you’re both on board, first things first: time to get your little tyke properly dressed. You’ll find that when he comes back to the room with his arms loaded with toys and animals, he’ll spot the big stack of diapers and he’ll already be feeling excited and happy: daddy has stocked the ship with enough supplies for a big journey. If you’re smart, you’ll have a protective plastic liner or sheet large enough for your bed, especially for those nights when your little tyke has nightmares and begs to sleep with daddy for protection. It might be an idea to just use that for the duration of your ‘voyage’. The plastic crinkling away under the two of you will make sure he doesn’t feel any anxiety about wetting his diapers while in daddy’s bed. (It’s important to never make him feel anxious about accidents or using his diapers). So before you cast off – time to get him out of his soaked night diaper. This is one of those times when a super thick diaper is called for. You’re giving him permission to play, to express the little boy that he is, and nice thick padding between his legs will help him feel secure. 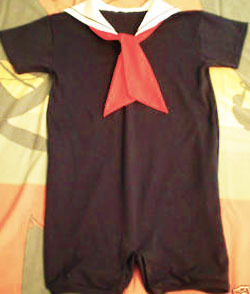 Dress him in a sailor romper, a onesie, or just leave him in his diaper with a cute pirate shirt or bright colored tee. As you set sail, remember that what’s important to your little guy isn’t just that you’re giving his imagination room to wander. Tell stories, imagine that your ship is being attacked by pirates, draw a map of your journey with crayons, keep a ‘sailor’s journal’ by cutting out photos from old travel magazines and gluing them into a scrap book, or read books to your little guy. But what’s important isn’t just what you do – it’s that you’re giving your attention and you’re being rewarded when you sense the closeness, security and trust that he places in you. After the excitement of the pirate battle at sea and other adventures, it’s time for lots of snuggles. Cuddle your little guy as your ‘boat’ gently rocks while anchored in a bay. Pull him into your lap and give him his bottle. Give his diaper a reassuring pat as he lies on his tummy reading a storybook. 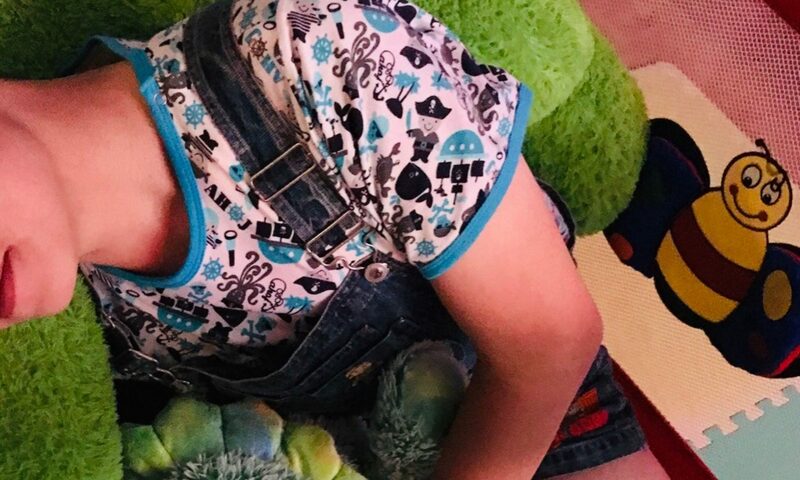 Because while you’ll always have a thousand ways to explore new worlds with your little guy, at the end of the day what he’ll remember is that he was with his daddy, he was loved and cared for, and he felt the peace and joy of just being himself. What a great way to spend the day as Dada and diaper boy. Wow, what a great adventure. I hope that I can go on such a great adventure someday. I liked the parts about feeling safe to use my diapers, sometimes I don’t feel safe, just embarrassed. I feel like I should have been able to make it to the potty sometimes. But sometimes I pee all day long! I recently discovered this amazing site, and this post gave my mommy some great ideas on how to spend our Saturday mornings. Thanks so much for the great writing and awesome ideas! Im the same as willy, i sometimes pee all day long.